A bus trip to examine the impact of the new airport runway on the natural wetland environment of Nudgee beach and Nundah Creek? 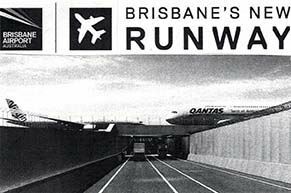 Guided tour of the the new Brisbane Airport Runway by the BAC Community Engagement Officer, including the new Dryandra Road underpass, a vital piece of the infrastructure for Brisbane’s new runway system. Lunch (main meal, coffee/tea and cake) at DFO and chance to shop.